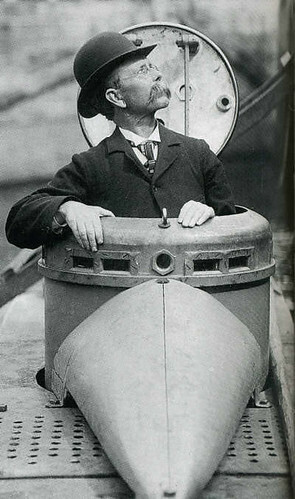 John Phillip Holland, who is known as the father of the modern submarine, was a native of Co Clare Ireland. Holland’s submarine design was initially accepted by the US Navy and later by other navies around the world. John Phillip Holland was born in Liscannor, County Clare in 1840. His father was a coastal patrolman with the British Coastguard Service. Holland grew up speaking Irish and only learned English at his local national school in Liscannor. Having completed primary education he attended the Christian Brothers School (CBS) in Ennistymon until his family moved to Limerick city where he attended Limerick CBS. He later joined the Christian Brothers. He was a teacher of mathematics in schools in Armagh, Portlaoise, Enniscorthy Drogheda, Cork and Dundalk until 1872. Holland left the Christian Brothers and emigrated to the United States in 1873. He settled in Patterson, New Jersey where he became a teacher at St John’s School which was run by the CBS. In 1879 Holland, with financial support from the Fenian Society in America, built a small submarine. The submarine, which was called the Fenian Ram, had limited success at first. The Fenians had hoped to use the submarine against the British navy but the plans never materialised. The Fenian Ram is now in the museum in Patterson New Jersey. Holland continued to develop his design and his submarine had a successful test off Staten Island in New York harbour on St Patrick’s day 1898. The submarine was purchased by the US navy and was named USS Holland. Six more submarines of a similar type were built for the US Navy. Holland later designed the first submarines for the British, Dutch and Japanese navies. He died at the age of 74 on August 12th 1914 in Newark, New Jersey, USA. John Phillip Holland, who built the first submarine was born in Liscannor Co Clare, Ireland, in the year 1840 On This Day. 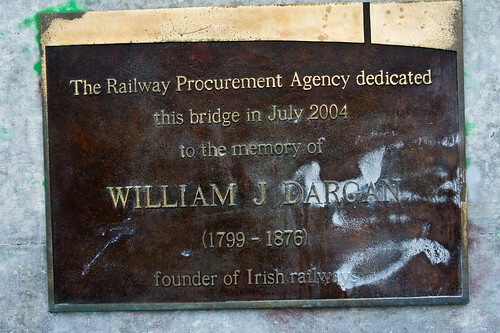 William Dargan, a native of Killeshin near Carlow town, Ireland was an engineer, railway contractor, and entrepreneur during the nineteenth century. Often referred to as the father of the Irish rail network, he was also responsible for building a host of infrastructure projects around Ireland. He funded the Great Industrial Exhibition in Dublin in 1853 and helped establish the National Gallery of Ireland. William Dargan was born in Killeshin near Carlow in 1799. He was educated locally and is said to have displayed a talent for mathematics. With the assistance of prominent local people such as John Alexander of Milford, Carlow and Henry Parnell MP for Co Laois, Dargan was employed by Thomas Telford building roads in England. He was involved in building the road from London to Holyhead. Another engineer, John Macneill who was born in Mountpleasant Dundalk County Louth, was working on the same project. Dargan and Macneill would later return to their native country to work on the building of the Irish rail network. Dargan returned to Ireland to work on the building of the road from Dublin to Howth. In 1831 he was awarded the contract to build the first railway in Ireland from Dublin city to Kingstown (now Dún Laoghaire). It was the first suburban and commuter railway line in the world and was built on time and within budget by 1833. Following the successful completion of the Dublin to Dún Laoghaire railway line, Dargan built the Ulster Canal. He later went on to build over 1,300km of Ireland’s railways. A great exhibition had taken place at Crystal Palace in London in 1851. Dargan offered to fund a similar exhibition in Dublin. What became known as The Great Industrial Exhibition opened on Leinster Lawn in Dublin on May 12th 1853. The Dublin exhibition was the first World Fair to have an exhibition of art. It was given an enthusiastic response by the visitors. The number of visitors exceeded one million, many of whom came on the railways built by Dargan. Among the visitors on August the 29th was Queen Victoria, the Prince Consort and the Prince of Wales. Dargan was offered a baronetcy by Queen Victoria when she visited him at his home in Mount Annville in Dublin in 1853. He declined the offer. Dargan’s final project was the building of the railway line from Dublin to Wexford. He died in Dublin at the age of 67 on February 7th 1867. A mural of Dargan hangs in the lobby of Bray railway station. Two modern bridges, one in Belfast and one in Dublin are named in his honour. There is a bronze statue of William Dargan located in the forecourt of the National Gallery of Ireland. William Dargan, engineer, entrepreneur and often referred to as the father of the Irish rail network, was born in Killeshin near the town of Carlow, Ireland in 1799 On This Day. Tony Ryan was an Irish aviation entrepreneur who became a successful businessman and philanthropist. He was the founder of Guinness Peat Aviation and a co-founder Ryanair. Tony Ryan was born near Thurles, County Tipperary, Ireland where his father was a train-driver. When he finished school he began working at a Factory in Thurles but later joined the staff of Aer Lingus working at Shannon Airport. With Aer Lingus and the investment company Guinness Peat Group Tony Ryan founded the aircraft leasing company Guinness Peat Aviation (GPA) in 1975. Guinness Peat Aviation, which had its headquarters at Shannon Airport in the Shannon Tax Free Zone, became the biggest aircraft leasing company in the world. In 1985 Ryan co-founded an airline company called Ryanair. The company provided daily flights from Waterford Airport to London Gatwick using a 15-seater aircraft. The airline carried over 5,000 passengers in its first year. The following year Ryanair launched new services from Dublin to London Luton. 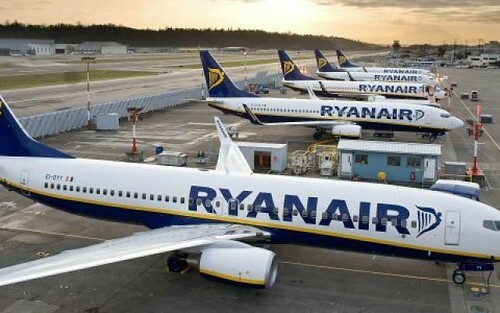 Passenger numbers began to grow rapidly so that by 1992 Ryanair carried almost a million passengers. In that same year (1992) Guinness Peat Aviation imploded when an Initial Public Offering failed and Tony Ryan lost almost everything. He concentrated on Ryanair and though he recovered some of his losses he made in GPA in 2,000 it was through the airline company that he became a wealthy man again. Ryan was a generous patron of the arts. He also funded various education initiatives. 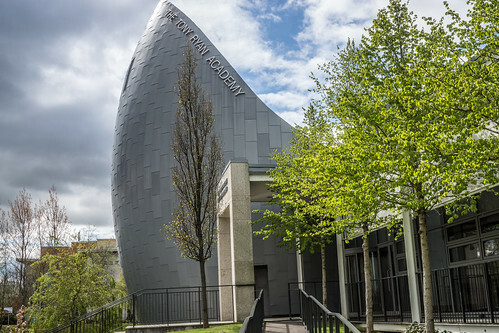 University College Galway and Dublin City University both benefited from his donations. Thomas Anthony “Tony” Ryan was born near Thurles, County Tipperary in the year 1936 On This Day. The 1990 Football World Cup, which was held in Italy, had as its theme tune ‘Nessun Dorma’. It was composed by Italian composer Giacomo Puccini and performed by Luciano Pavarotti . Nessun Dorma is an aria from Puccini’s final opera, Turandot which was left incomplete at the time of his death. 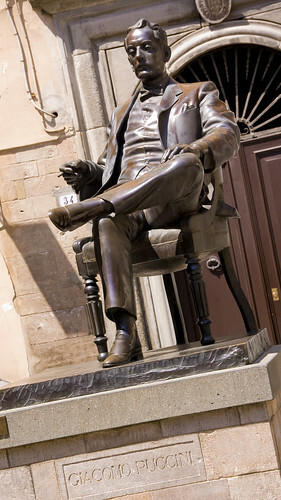 Giacomo Puccini was born in Lucca, Tuscany on December 22nd 1858. His father, who was the musical director of the Cathedral of San Martino in Lucca, died when Puccini was five years old. The city of Lucca paid for his education and kept the position of Musical Director open for him so that he could follow in the family tradition when he came of age. He studied locally and in 1880 went to the Milan Conservatory to continue his studies and graduated in 1883. In 1876, while still at school, Puccini attended a production of Verdi’s Aida in Pisa just over 30 km from his home city of Lucca. The experience convinced him to pursue a career in opera. Following graduation from the Milan Conservatory, Puccini composed ‘Le Villi’ for a local competition. When it was successfully performed later at Teatro dal Verme in Milan it was purchased by music publisher Giulio Ricordi. A revised version of the opera was successfully staged at La Scala in Milan on January 24th 1885. Puccini and Ricordi became friends and cooperated on operatic productions throughout their lives. During his career Puccini’s compositions included La Bohème, Tosca, Madama Butterfly, and Turandot which was completed by Franco Alfono. Puccini became famous and his operas were performed all over the world. His works are among the most frequently performed in the history of opera. In 1920 he began work on Turandot. In 1923 he was diagnosed with cancer of the throat. He died at the age of 65 on November 29th 1924 while undergoing radiation treatment in Brussels. He is buried in his villa at Torre del Lago about 25km east of Lucca on the coast of Tuscany. Puccini’s opera ‘La Boheme’ premiered in Turin, Italy in the year 1896 On This Day.